SLASH FT. MYLES KENNEDY & THE CONSPIRATORS will return this fall with its as-yet-untitled third studio album. 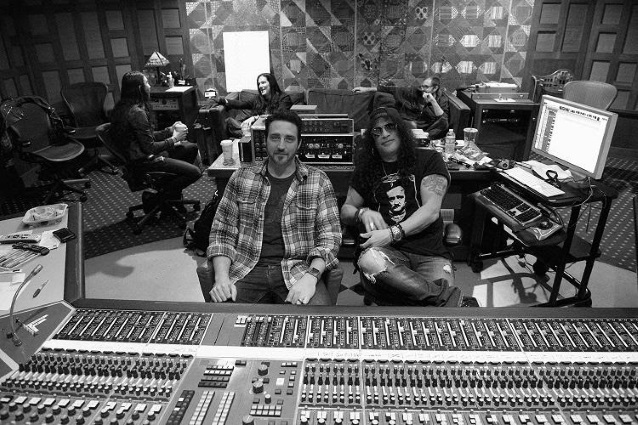 The group — Slash (guitar), Myles Kennedy (vocals), Brent Fitz (drums), Todd Kerns (bass, vocals) and Frank Sidoris (guitar, vocals) — has entered the studio with producer Michael “Elvis” Baskette (ALTER BRIDGE, IGGY POP, INCUBUS). Expect the group to announce a full North American tour for the fall. Rumors of a new CONSPIRATORS disc were started last December when Slash‘s girlfriend Meegan Hodges told a fan on Instagram that the guitarist was in the studio with singer Myles Kennedy recording the next CONSPIRATORS album. But Kennedy claimed in a radio interview a short time later that there were no concrete plans for him to reunite with Slash and work on new music. The vocalist, who also fronts ALTER BRIDGE, went on to say that he would spend most of 2018 touring in support of his solo album, “Year Of The Tiger”, with 2019 likely to be dominated by his commitments to ALTER BRIDGE. After a fan reached out to Meegan on Instagram asking her to clarify her previous comments following Kennedy‘s remarks, she responded, “Maybe you should ask the band guys,” and followed it up with a smiley face. Kennedy has said in various interviews that he and Slash had about half an album’s worth of new material in the works toward the end of the “World On Fire” touring cycle, but Slash‘s touring commitments with GUNS had prevented him from becoming involved in any other projects. After Slash and the CONSPIRATORS toured “World On Fire”, rumors about the long-awaited GUNS N’ ROSES reunion tour began to circulate and were confirmed in early 2016. “Year Of The Tiger” was released on March 9 via Napalm Records.